Good morning guys, so I thought I would share some of the design things I have been loving lately. 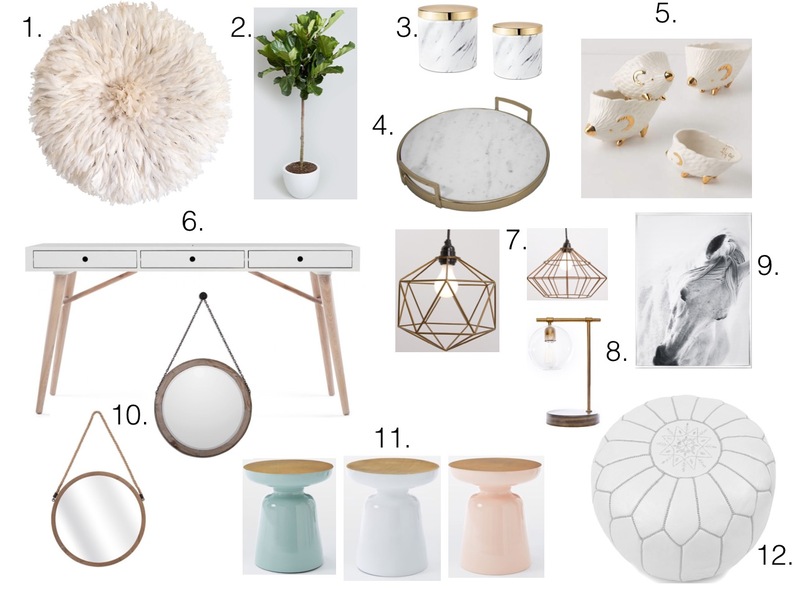 I feel like there is sooo much that I am lusting after for the house and as I'm sure you guys can agree, the home is always a work in progress! 1.) If you haven't already seen one of these meet the "Juju Hat". I desperately need one of these for my wall I think they are so beautiful. They are actually handmade African feather headdresses that chiefs wear for ceremonies but they have come a long way since then and are everywhere in design lately. My husband laughs at me but seriously guys I will be getting one these haha. 2.) Ahh the fiddle leaf fig tree. I am going on the hunt for one of these in the next couple weeks and can not wait to get it into the house. I am just hoping that I don't kill it because I don't always have the best green thumb! These can be a little picky with light exposure so I am hoping it will work in our family room. 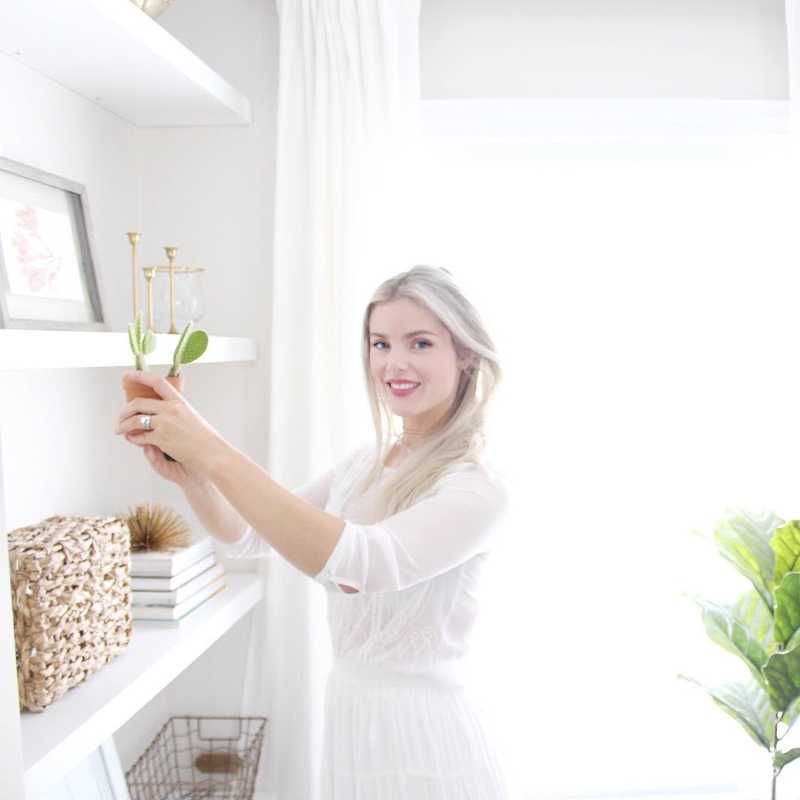 I love having living greens in the house it adds such a nice feel and visual interest. 3.) I am loving everything marble lately and actually have a diy coming up soon for you guys. These marble and gold canisters are beautiful and I would love them on our kitchen counter. 4.) This tray is so gorgeous and would look great on a coffee table, large bathroom counter, or as serve wear in the kitchen. 5.) These Anthropologie hedgehog measuring cups kill me, I want them so badly but they don't seem to be available any more unfortunately. I am hoping to come across something somewhat similar at Homesense. 6.) I absolutely love this desk, the two tone colour, shape, everything. I am a sucker for mid-century style pieces and this one is no exception. 7.) These wire pendants are so pretty and dainty. I love how they make a statement but still feel airy and light. I want to put something like this up in our laundry room when I start to redecorate that space. 8.) This task light is so pretty and I feel like it would look perfect on the desk pictured above. I regret not getting the Target style one when they were still in Canada. 9.) I love horses so much and I am determined to find the perfect picture of one for the house. Ever since I was a little girl I always wanted one. My dad actually wanted to buy a miniature horse and trolley when I was in Junior high school, his name was Speedy but it never actually happened. Mostly because there is no way my mom and I would have been able to let it sleep outside in the winter and alas a miniature horse isn't exactly the best house pet. So I will just stick with a piece of art. 10.) These hanging style mirrors seem to be everywhere lately and are so pretty, the hanging detail is such a nice finishing touch. 11.) I adore these pastel mini tables, they are chic and would look great beside any chair or sofa as a little place to put your coffee and books. 12.) Lastly the leather Moroccan pouf. I have wanted one of these for a long time but they seem to be difficult to find. They have such a nice texture and of course you know I want it in white because #allwhiteeverything is my life.